Magical Weather isn't feature heavy, but it looks great, provides 24-hr and 6-day forecasts, and includes beautiful background animations to help you tell your rain from your shine. 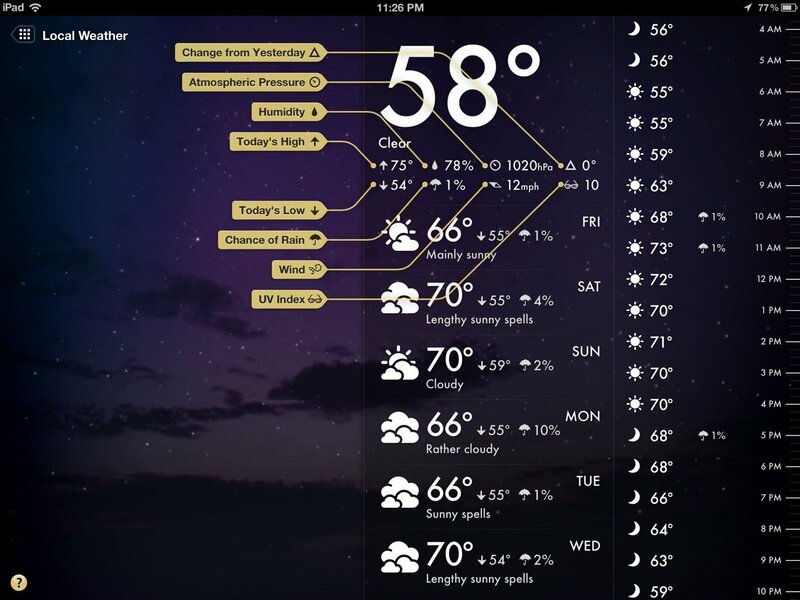 Unlike the iPhone and iPad, the iPad doesn't include a stock weather app. 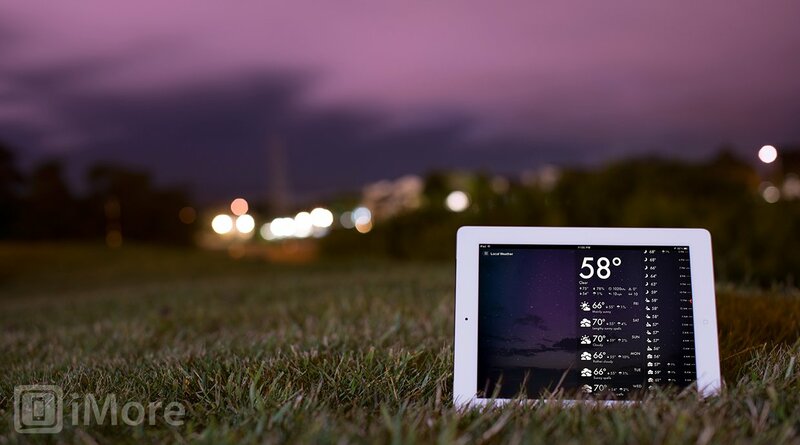 Apple reportedly didn't think weather looked good on the bigger screen. Magical Weather is one of a very small handful of App Store apps that shows Apple they were wrong. But is Magical Weather the right weather app for you? Magical Weather is by Apple Design Award winning developer Sophia Teutschler of Sophiestication, whose catalog includes X-Trail, Articles, Groceries, and Cover Sutra, among others. All of her apps share two things in common -- they're incredibly focused, and they're delightfully realized. Magical Weather is no exception. The home screen of Magical Weather displays up to nine thumbnails, each representing a different location. Each thumbnail displays the current temperature, an icon that represents the conditions (like a raincloud for rain), and the background is an image that also describes the current conditions. When viewing the weather for a city, the background is more than just a photograph -- it's an animation that represents the current conditions at that location. For example, if there's a thunderstorm, the background will include moving clouds and rain with an occasional lightning bolt (yes, it took me a million attempts to time my screenshot just perfectly to get the above screenshot). On the righthand side, you will see up to two columns of information. The top of the first column gives the temperature, today's high and low, humidity, chance of rain, atmospheric pressure, wind speed, change from yesterday, and the UV index. Underneath this cluster of information is a 6-day forecast. The second column is a 24 hour forecast that can be scrolled through. For each hour, Magical Weather provides the anticipated temperature and chance of rain. To hide the 24-hr forecast simply swipe to the right. With only one column displayed, swiping it down will hide the 6-day forecast, letting you enjoy the background animations in all their glory. Although Magical Weather isn't the most feature-filled weather app in the App Store, it's a pretty app that will be enjoyed by users looking for something that can also play the role of a docking app. 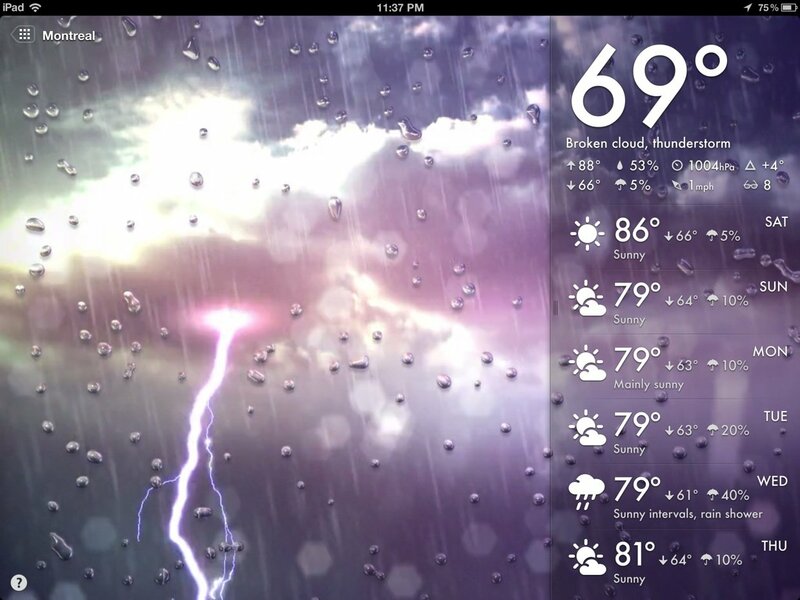 When your iPad is not in use, leaving your iPad docked on your desk with Magical Weather is a great way to enjoy your iPad even though you aren't directly interacting with it. Note: Magical Weather is currently on sale at 50% off for a limited time.